Have you grown tired of the mess and hassle of your wood-burning fireplace? Would you love to add the ambiance, comfort, and beauty of a fireplace to just about any room in the house? A gas fireplace could be the solution for you! Once shunned as fake imitations of the real thing, gas fireplaces have vastly improved in recent years. Gas fireplaces from Mendota are a prime example, combining stylish beauty and clean, efficient heat that we’re proud to recommend to our customers every day. At LanChester Grill & Hearth, we field questions about fireplaces, pretty much year round. Whether it’s from someone looking to warm up their home in the winter, replace an existing hearth with something more modern and efficient, or an outdoor enthusiast looking to add a cozy touch to their outdoor living space, we’re always happy to help. Fireplaces can be romantic, inviting, but also incredibly efficient when it comes to providing extra warmth and ambiance to a home. Depending on your needs and what kind of look you’re going for, there are a number of routes you can take. To help you out, we took the most common questions about our fireplaces—and here’s what we have to say! 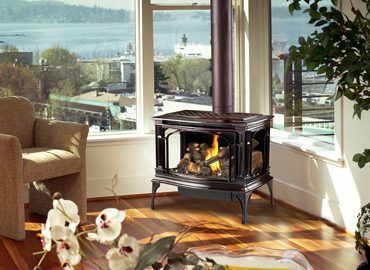 Homeowners struggle with choosing between gas, wood, and pellet when trying to find the best stove for your home. Between their similarities and differences, there’s a lot to consider. Selecting a fireplace is an investment whether you install a brand new stove or upgrade from an old one. Fireplaces are a wonderful addition to any residence. They provide a perfect spot for family gatherings and intimate affairs, all while keeping things toasty warm. The downside to a fireplace insert is their age. They take significant maintenance and if an owner puts it off too long, it could require masonry repairs to restore its functionality or make it safe for use. Even if you keep your fireplace in great shape, you might notice that you lose more heat than you’re getting—that it’s just not as efficient as you need it to be.